With a total of six different parklands and plenty of attractions thrown into the mix, the Allegheny County Parks feature something for everyone, ranging from landscaped gardens and golfing, to a very popular wave pool at Boyce Park, where in the winter, visitors to Pittsburgh and also treated to superb skiing opportunities. For the very best views of the Boyce Park and the city of Pittsburgh, do be sure to head on up to the observation room. Locals from Pittsburgh always find the peace and quiet within Latodami Nature Center especially appealing, while for tourists, the Phipps Conservatory and Botanical Gardens come highly recommended, being located within Schenley Park. 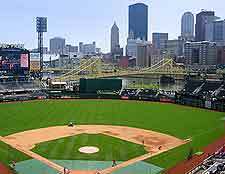 PNC Park is a major-league baseball park and the official home of the city's very own acclaimed baseball team, the Pittsburgh Pirates. This ballpark is of epic proportions and when packed out, can accommodation audiences of almost 40,000 spectators. 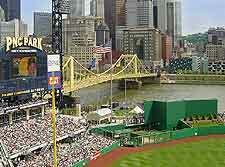 PNC Park is highly regarded as being one of the finest ballparks in the United States, being well known for its grand architecture. Boyce Park is one of the regional Allegheny County Parks and makes the very most of Pittsburgh's highly seasonal weather, lending itself to outdoor activities throughout the year. In the summer months, tennis, ball sports and picnicking is the order of the day. However, when the snow begins falling, the Boyce Park becomes nothing short of a winter wonderland, with an exceptional skiing area, with slopes for all abilities, skiing instructors and no less than five different ski lift. Sandwiched by both the Squirrel Hill and Oakland neighborhoods, Schenley Park has become an integral part of the local community, being used for a series of seasonal events. Each summer, many open-air concerts and theatrical performances take place here. 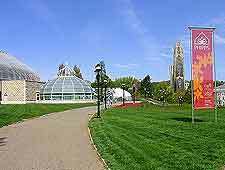 Visitors will enjoy the numerous attractions within Schenley Park, such as the Phipps Conservatory, which lies on the northerly side, along with superb Botanical Gardens, where a collection of colorful subtropical plants awaits. Also of note are the hiking trails, a popular golf course, and in winter, cross-country skiing and even ice skating. The Frick Park has become an important nature reserve and is more than 450 acres / 192 hectares in size. As well as being home to the Frick Environmental Center and very areas of woodland and flower meadows, the Frick Park also offers much for sporting enthusiasts, contains its very own basketball court, ballparks and tennis courts. Families with appreciate the playgrounds, which come complete with seating so that the grown-ups can watch the children playing. A firm favorite with locals, the Highland Park is always buzzing in the early morning, when joggers take to the pathways to burn off their breakfast calories. Close to the city's zoo and aquarium, the Highland Park is also where you will find the rather scenic Carnegie Lake, along with innumerable tennis courts, several different play areas for children, picnicking tables, tennis courts, a popular swimming pool and many open expanses of lawn. The Point State Park covers more than 35 acres / 14 hectares and stands at the point where both the Allegheny River and the Monongahela River converge. In the summer, there are always things to do here, with the fireworks display on Independence Day being particularly impressive. Look out for the fountain, which spurts water high into the sky and is always a favorite with children. Encompassing more than 3,000 acres / 1,210 hectares, the North Park is the biggest of its kind in the whole of the Allegheny County and offers endless respite, away from the busy center of Pittsburgh. With everything from tennis and golfing, to boating and fishing on the lake, and ice-skating on the North Park's very on rink, there are always things to do here, suiting all ages. Plenty of seating is on hand for picnickers, while the Latodami Nature Center completes the main attractions. Situated on in the city's northern suburbs, the Riverview Park boasts an array of recreational activities, suiting those who enjoy playing baseball and tennis. Playing areas are available, while on a hot sunny day in Pennsylvania, the park's swimming pool provides a good place to cool down. The university's Allegheny Observatory in also located here and has become a very popular attraction. 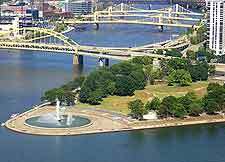 Named after a rather famous and much-loved local baseball player, the Roberto Clemente Memorial Park lies near to the Pittsburgh ballpark and on the northern bank of the Allegheny River. Due to its riverfront setting, many people come here to boat and fish, while the various trails lend themselves to both walking and cycling.